My first game in the series was Dr. Robotnik's Mean Bean Machine in the Sonic Mega Collection. It was fun. After that, I found a thing in Nintendo Power previewing Puyo Pop Fever. I immediately noticed a resemblance, and my unaware mind thought of it as a ripoff...but a ripoff that actually looked appealing, thanks in no small part to Amitie. The I looked into it, and found out that what I was looking at was an unaltered Puyo game, and that Mean Bean Machine wasn't the original after all. Sadly, it wouldn't be until last year that I checked it out. It's quite good, but I regret not playing it earlier. Then I decided "you know what? Time to play catch-up!" So that's what I've been doing the past few months. Basically, I'm trying to right the wrongs of my younger self not playing this instead of the Shark Tale game. I also have the PS3 version of Puyo Puyo Tetris. It's quite fun itself. Gotta admit, if not for this, I would have stuck to my old PS2 copy Tetris Worlds for my console Tetris playings. I've got the 20th Anniversary game coming in the mail soon. DS version, obviously. Would have gotten the 3DS version if not for that damned region locking Nintendo put in there. By the way? Amitie is my favorite character in the series. I just love everythiing about her. In fact, I actually have a crush on her. Laugh or cringe if you will. I know she doesn't exist, shut up. You can also disciss the Madou Monogatari series here if you wish (as the Compile era characters originated from it). Though in regards to that, my only experience is Sorcery Saga: Curse of the Great Curry God. I'm actually having fun with it, though the lack of the original cast is a bit disheartening, though for legal reasons, it had to happen. For what it's worth, though, I do like Pupuru, at least. I intend to play some of the older installments evenually, though. My first technical exposure to the Puyo Puyo franchise was via Dr Robotnik's Mean Bean Machine and Kirby's Avalanche, I already loved those two games, but didn't find out about Puyo proper until 2006 when Fever 1 came out in the EU. The cover caught my attention thanks to me liking Amitie's design and the Sonic Team logo being on it and a quick look on the back of the box showing that it was like the Kirby/Robotnik puzzle games was the final thing needed to convince me to buy it and needless to say I fell in love with it, in fact Fever is still my favorite gameplay rule in the series. A friend of mine caught wind of that and got me the imported PSP version of Fever 2 as a gift next year, which was the game that made me decide that I want to follow this series,. I do plan on tracking down Puyo Pop/Minna de Puyo Puyo for the GBA and I'm intentionally holding out on Puyo Tetris for the slight chance that it might, just MIGHT get a localication after all, I'm not holding my breath, but you never know, the Tetris moniker attached to it might make it possible after all. As for characters I love so many characters in this series that it's not even funny, thought Sig stands out as my favorite, everything from his design,personality and bizzare backstory just appeals to me. Sega may have to go through Ubisoft for a localziation, though I'm not sure. I was before, but who knows? Ubisoft has a hand in this? I don't think I ever heard that before, do you know more? I meant with the Tetris license. Far as I know, Ubisoft currently has that one, at least in some if not all places. I don't understand the full details, but I did notice some older Tetris games were no longer on the American eShop, so they must have some pull. As for Puyo Puyo Tetris proper, if you wanna pick a version, the PS4 and Xbox One versions have the DLC right in there. As for portable versions, thank the Vita for not having region locking. I figured that the Tetris side has sonething to do with this, to be honest I don't have high expectations regarding a localization anyway knowing Sega's past with Puyo and how the west only barely got Fever 1, so I don't think that Ubisoft will change much either way, I'm just waiting in case a miracle happens and if not then it's a import for the PS3 version for me. This not having a YTP upload was a crime I tell you, A CRIME! Been meaning to post this since it happened, but I never did...until now. 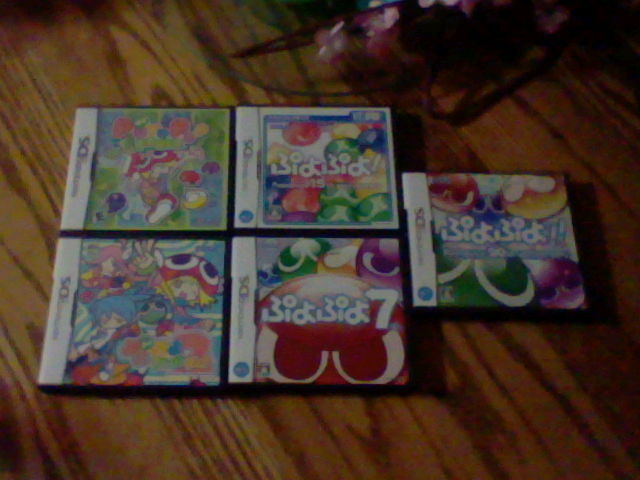 Got the complete DS Puyo Puyo collection! I mentioned that I modded my Wii. Why? It wasn't entirely for Project M, though I hear it reduces issues running that mod. No, I did it for the DARK ART of emulation. Yes, after years upon years of being adamantly against it, I finally broke down and did it. Why do I mention this here? Decided to try the English fan translation of Madou Monogatari: Big Kidnergarden Kids. Figured whoever owns the rights probably doesn't care at this point. While the ROM isn't perfect (I just bumped into some garble. This isn't an isolated incident, apparently), I've been having a blast with it. A damn shame it was never officially brought over. I could see it having a cult following at the very least. The game is pretty easy, but after pulling my hair in some other games, that's actually pretty relaxing. So far, I haven't had to do too much level grinding, which is good, seeing as how I tend to quit RPGs that ask me to do a lot of that. Plus, the game is just so darn cute! Little Arle dances during battle, you fight enemies like cats, and then there's the Puyo. He just says "Puyo puyo!" before battle. I thought that was neat. I haven't beaten it yet. Not even close, so it could get worse, but so far, it's fun. Incidentally, I got my Retro Trio in the mail. Now I need to get some more Puyo Puyo games, especially since it runs Super Mario RPG perfectly (I bring that up because apparently, other clone consoles have trouble running it). Decided wheteher I get the Mega Drive or Super NES version of the first game would depend on this question; which one's cheaper? The Madou series is certainly one I'm interested in, especially Tower of the Magician sice that one has Schezo as the main character, unfortunatly I don't think there are any patches for that one. "Hey Schezo, don't lose your head over nothing. Yuck! Yuck! Yuck"
While this will likely not do anything, especially due to Puyo's lack of any western presence, it's at least nice to see that a lot of people and not just Schezo want her and I would certainly have a good reason to go back to Smash if she got in. Apparently, Sega decided the way to bring over Puyo Puyo Quest was to alter it into what looks like a cheap imitation of other smartphone games. It's known as Cranky Food Friends, and despite the name, Cranky Kong is nowhere to be seen. Sad; he's very much needed here. I would have been less angry if it was altered into a Mean Bean Machine sequel. At least the AoStH cast might have made a grand return. I sometimes wonder if Sega activly want people to hate them, I mean who is this meant to appeal to? Puyo fans are angered and the mainstream audience won't pay special attention to ''food based mobile puzzler 10000#''. Oh well. There's still importing, at least. I'm gonna hold on to hope that someone else eventually buys the rights once Sega goes under. I'm surprised Sega's even around after the dumb things they did before. Yeah there is still that and I'm glad that Puyo is still alive at all, unlike any other non-Sonic Sega franchises. I just wish that Puyo would get more global reconication, because it really deserves it, but alas Sega doesn't want any of that and it won't ever change. Well, everything I'm seeing suggests Project Mirai DX will retain the Puyo Puyo minigame unaltered for it international release. That's gotta count for something...right? The new art style is awful. Go away moe pls. You mean for Puyo Puyo or CFF? If you mean the former, I highly disagree, though quality is subjective. If it's the latter...agreed too much.